Technology that can age wine within minutes sounds like it belongs in the same too-good-to-be-true boat as those ads for that “one food that kills belly fat.” But the inventor behind a device that claims to do just that, the Sonic Decanter, recently invited to me to test out this fantastical technology. Does it work? 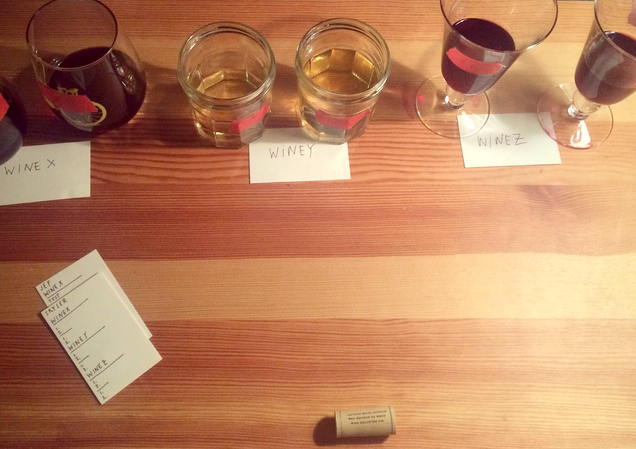 As it turns out, tasting a bunch of wines is fun either way. By zapping your bottle with ultrasonic frequencies, the creators of the decanter say it softens the tannins and expels the sulfur dioxide—the stuff added by winemakers to preserve the wine longer, even though it can change the way cheaper bottles taste. “It appears that the changes we generate in 15 to 20 minutes are the same changes that occur in the components of the wine when they bottle age for five to eight years,” says Mike Coyne, the creator of the device, over the phone. Basically, it sounds like alchemy for wine. Of course, alchemy has a thousand-year history of parting fools with their money. And drunk fools? Easy pickins! Needless to say, I was (and remain) skeptical of the science behind the decanter. But as a cheap wine drinker I was eager to try it out, and when Coyne’s team offered to send me a prototype—which will retail for $250 when it ships next year—I said yes. Coyne started out in the beverage business but got into the wine industry more than a decade ago. He heard about the ultrasonic wine theory through a scientist friend, and it’s taken him and his partners three years to develop the device. Coyne couldn’t tell me the frequency the decanter runs at because it’s proprietary to his company, Dionysus Technology Concepts. At too high of a frequency, ultrasound can “toast” the wine. Too low, it doesn’t do much at all. It took years of tweaks to get it right. Coyne doesn’t go nearly that far. 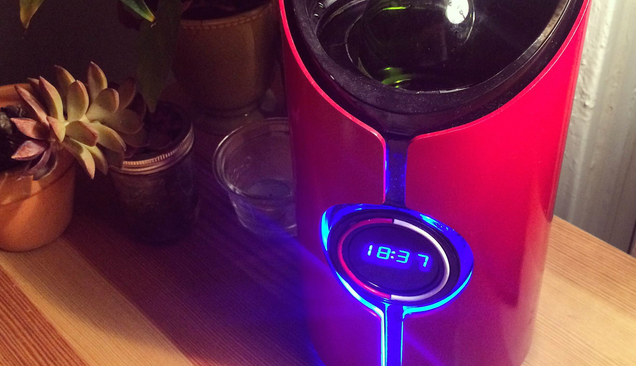 He describes the device as a way to subtly boost the taste of inexpensive wines—not a magical way to turn $10 in $350. According to him, a comparative analysis of 300 samples done by a large independent wine laboratory (they couldn’t name the exact lab because of existing NDA) resulted in a 15 percent reduction in sulfur dioxide and reduced the acidity levels in the wine’s pH. Those changes are supposed to translate into a more drinkable wine: Less acrid, less acidic, and more complex. To do just that, I rounded up a couple of wine drinkers, if not connoisseurs, who graciously agreed to brave the 0-degree weather for the promise of near-bottomless free wine. Using the decanter is easy—a plus, given that you’ll be operating it while consuming alcohol—and the zapping takes two steps. First, pour two cups of cold water into the decanter and put the open bottle in the canister. Then press the red or white button depending on the wine. The decanter’s LED face blinks on and a high, thin, chk-chk-chk-ing continues for 15 minutes for white and 20 minutes for red. Then imbibe. I had tried the decanter on several bottles myself, but I was interested in finding out whether a group of drinkers could even tell the difference between the pre- and post-zapped wine, so I set up a (very, deeply unscientific) blind taste taste. We tried three wines: A $13 chardonnay that most of the group drinks frequently, a $14 cabernet sauvignon none of us had ever tried, and a Whole Foods $3 bottle of merlot that we drink often because… Whatever, don’t judge. It turned out that 75 percent of us preferred the zapped versions of both reds. The taste was noticeably smoother, with less of the acrid bite that the straight-out-of-the-bottle wine. The white tasted different too—but in this case, half of us chose the zapped bottle and half of us preferred the original. Perhaps because of the fruity, tart notes that already existed in the chard, they simply tasted like two different wines. Of course, our tiny sample size tells us virtually nothing about the overall effectiveness of the decanter. But anecdotally, the wine did taste pretty different—it wasn’t as acidic or harsh as the fresh stuff, and you could taste more layers and notes. The most common comment was that the wines tasted truly, distinctly different once they’d been dunked in the decanter, whether or not the end product was more or less preferable. I had gone into the test a skeptic, and emerged as a slightly drunk believer in the claim that this gadget actually does change the taste of wine. Does the science behind the decanter check out? Without evidence, it’s impossible to say. But to us, it tasted different. But that’s the thing about wine, and about taste in general: It’s subjective. This is an industry built on manipulating the way we perceive its product, either through suggestion, price point, or even something as simple as label design. In that light, the Sonic Decanter seems like less of a gimmick and more like a novel application of a technology to an already deeply subjective experience. Coyne has no pretensions about his device, either. He told me that he imagines people using it almost as a party game, like Twister or charades—a way to enhance the experience of drinking wine, not a way to spin gold out of hay. And rather than marketing it to œnophiles who buy $300 bottles, he sees it as an investment for people who buy inexpensive wine: If you think it makes that cheap wine taste even $10 better, the decanter would pay for itself after 25 bottles. In short, it’s impossible to say this thing truly does what its creators claim, but it’s pretty fun to try to taste the difference. Either way, you’re drinking wine you already like, so it could be worse. The Sonic Decanter has already reached its goal on Kickstarter, and Coyne hopes to ship in 2015. If you’re into wine gadgets and want to test your own tastebuds, check it out.